There is something sweet on the menu—no, wait…it is the menu! 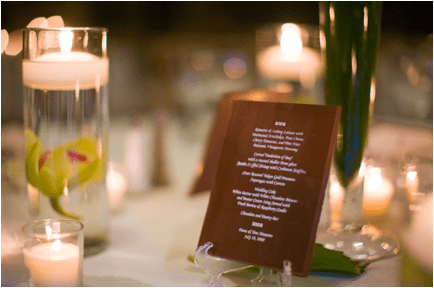 If you are looking for fashion meets function at your wedding, these chocolate menus are perfect to double as menus and favors! Edward Marc Chocolatier, the 95 year-old family-owned company, specializes in creative and custom packages for weddings. 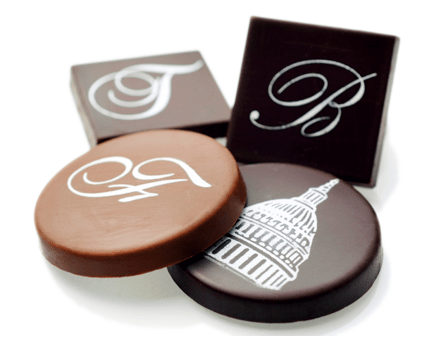 Key products from Edward Marc’s wedding lineup include customized chocolate menus ($12, available in milk, dark or white chocolate) or personalized medallions ($13); the must-have cordial cups ($15, available in milk, dark or white chocolate), or the Chocolate truffles,in Raspberry, Amaretto, Champagne and Espresso (available in a wide variety of sizes and combinations). Another reason to heart them: 20% of each sale via EdwardMarc.com can be donated to the partner charity of the new couple’s choice. Current options include the Make-A-Wish Foundation, the Wounded Warrior Project, The Children’s Institute, the Clinton-Bush Haiti Fund and the Touch A Life Foundation.